While meditating should we focus entirely on just one sensation, and if so wouldn’t this be restrictive? It seems that this would replace being mindful of the experience as a whole since we would only be concentrating on one aspect. When we are feeling so many different sensations how can we be mindful of all our feelings? Mindful attention can work in two different ways, one way is to focus more narrowly and the other way is more open. Although different in approach, they’re both worthwhile. When someone is narrowly focused they’re paying close attention to just one thing at a time. Just because all your focus is on just one thing, excluding all others, does not indicate that you’re unmindful. You are deliberately focusing your attention in this manner. You’re fully aware of what it is that you’re doing and the reasons for doing it. You most likely have an awareness of the major connections between the focus of your attention and what else is going on, specifically how you’re feeling. This is what mindful attention is. The truth is that we do have the ability to be mindful and be focused at the same time. 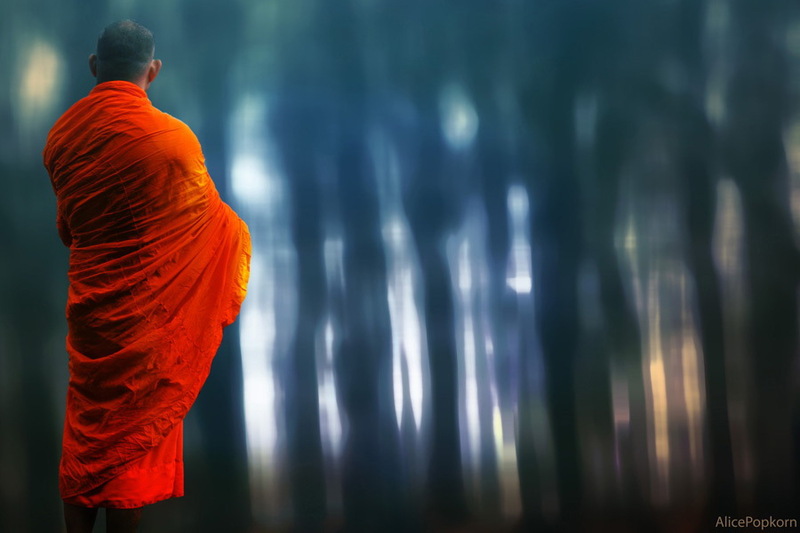 When Buddhists meditate they employ techniques which allow them to flow towards a state of jhāna/dhyāna, or meditative absorption. This approach involves focusing our attention on one particular thing. The practice of jhāna meditation will progressively narrow your scope of awareness until your mind reaches a state of contentment, is less distracted, becoming totally absorbed in one thing. The “one thing” we’re focusing on while we meditate or are absorbed in during other mindful activities can change. We focus our attention on different experiences as they unfold or become more important, or we deliberately seek them out. And we do this mindfully such as when we body scan or are involved in a walking meditation, or mindful eating. Without a doubt we certainly have the ability to focus our attention on one thing in an unmindful way as well. This is what we do most of the time. We don’t do this consciously and are not even aware that our focus is on just one thing. We’re also not probably even aware of the associations between the object of our focus and other aspects of what we’re experiencing – for example we might be totally focusing on a certain thought, and this thought is stressing us out but we really aren’t making the connection so don’t realize we’re actually causing the stress ourselves. Because the focus of our attention changes we can jump from one thought or idea to another and another and not realize we’re doing this. The common term for this is “monkey mind”. Mindful attention can be more open and this happens when we are relaxed in our attention. Even our physical gaze can wander or be unfocused with little or no attempt to focus on anything in particular. This can all be happening while we may be lightly focused on something within our field of awareness. In this state of open mindfulness we leave ourselves open to any and all sensations that well up in our consciousness. This can come about during a walking or sitting meditation but from my own first-hand experience it will more likely arise after a time spent body scanning. You’ve basically attended to your experience and now you open up and are happy not to stay focused on one particular thing. It’s not a case of you running around in your mind picking up all the various sensations arising in your consciousness and gathering them together to create a sense of wholeness. This is the way I think of it: Even when you’re not actually paying attention to each and every sensation you’re feeling, such as that of your clothing touching your body, your skin nerves are busy sending information to your brain. But these minor sensations are being filtered out so that you can maintain your focus on one thing at a time. This is why we don’t really notice these minor sensations unless something happens to refocus our attention. When we practice open awareness we are letting go of all effort to focus which allows us to bring into our awareness all the various sensations arriving in our brain, but which haven’t entered our consciousness because they’ve been filtered out. We aren’t making open awareness happen as we’re just relaxing into it. This doesn’t mean that focused attention is intentional, as opposed to being unconscious. Yes of course we can deliberately have a narrow focus, but the idea of jhāna meditation is that we allow our mind to become absorbed into being narrowly focused. This might be because we love what we’re doing and become absorbed into this state of mindfulness. Even when you’re meditating with open awareness, something will grab your attention which demands you pay attention. This could be a physical pain, an emotion or a loud sound and you may have to mindfully give that your full focus. When you do that you then change your meditative state in a narrowly focused manner. You’ll attend to that matter whatever it is that’s demanding all your attention, and then when the urgency dissipates you can release that and return to a state of more open awareness. There’s this fluctuating between open and focused awareness that can go on while meditating. You may want to actually perform this exercise by sitting and taking one sensation from breathing and totally focus on that, and then relax and return to a more open and broader state. After a while you can then return to a more narrow focus, and then return to a more open and broader awareness again. This can be compared to a “gentle workout”. The point I’m trying to get across is that we have the ability to pay mindful attention either focused or open, and either state has value. I’m not claiming that either is better than the other. The fact is that they can complement each other and I recommend that we practice both. Tagged awakening mind, focus your mind, focused mind, mindful meditation, opening your awareness. Bookmark the permalink.